I was thinking about you this morning and journeyed over to your Facebook page and found the link to this live web cam. Wow!!! Thanks so much. I hope all is well with you. I saw that you had another book signing yesterday and I missed it. Will there be another one any time soon? Hi, Tammy! Thanks for your comments. 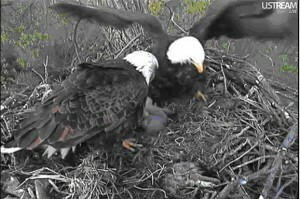 I do love watching these baby eagles–more like teenagers now… When I first found this, there were something like 4 million viewers–now 121 million have viewed it. Sorry I missed you at the book signing. I will be sure and let you know ahead of time when another one is coming up!